StarWars.com speaks with the set dresser behind some of Star Wars' most iconic ancient weapons, hunks of junk, and wretched hives. Compared to the bright, clean aesthetic of most science-fiction, Star Wars’ futuristic past went for something a little different: a grimy, lived-in look that made a galaxy far, far away feel much more like home. 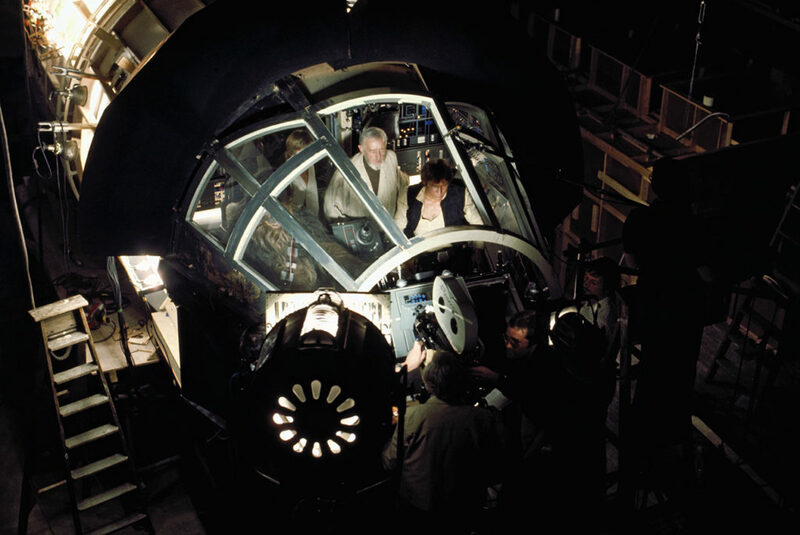 The Millennium Falcon was a patched-together mess, inside and out — “a piece of junk,” as Luke Skywalker called it, even though it was essentially the coolest thing we’d ever seen. We met Han Solo and Chewbacca in the smoky Mos Eisley cantina, filled with strange aliens and dangerous bounty hunters, a definite space dive bar if there ever was one. 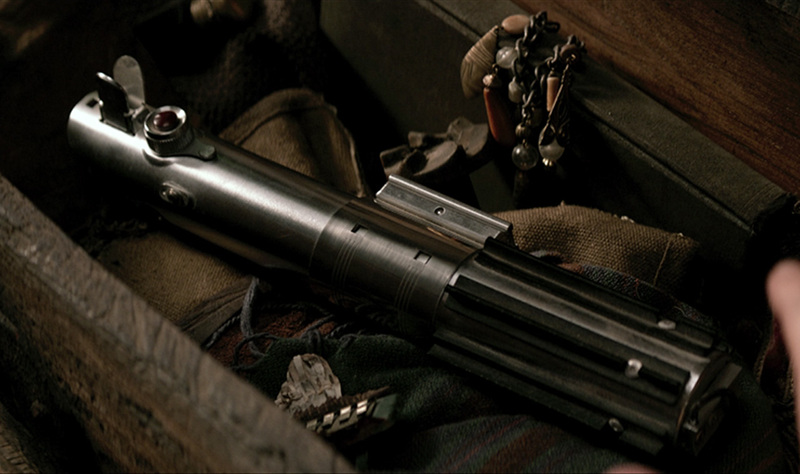 Han’s blaster looked like something you’d seen somewhere in real life, but it still seemed other-worldly. Star Wars, somehow, felt real, and the world loved that aspect of it. StarWars.com: It’s obvious that you had a big impact on what Star Wars became. To go back to the beginning, it seemed that you had an innate understanding of what the universe should look and feel like. Roger Christian: Yes, I think that was my sensibility and I had to analyze it afterwards. Originally, I went through that [in my book before it was cut] — being very young and filming my Dinkys [toy cars], because I never thought they were real. And I’d add bits to them and paint them and put them in the garden and try to make real scenes. When I look at illustrations, everything that I ever was attracted to, as it were, in the past, came from that real environment. Not a science-fiction imaginary one. As soon as George [Lucas] and I met in Mexico, he just said, “I’m trying to make this science-fiction film,” and I said, “Well, I didn’t like Flash Gordon.” I didn’t like any of these films that I saw, because I didn’t connect to it. You didn’t think it was real. He just said, “That’s what I want. I’m trying to make a dusty Western,” and we were making dusty Western sets for Lucky Lady at the time. So it wasn’t just words, it was there in front of him. StarWars.com: In reading your book, there’s something that seems almost Beatles-esque about the magic of Star Wars. 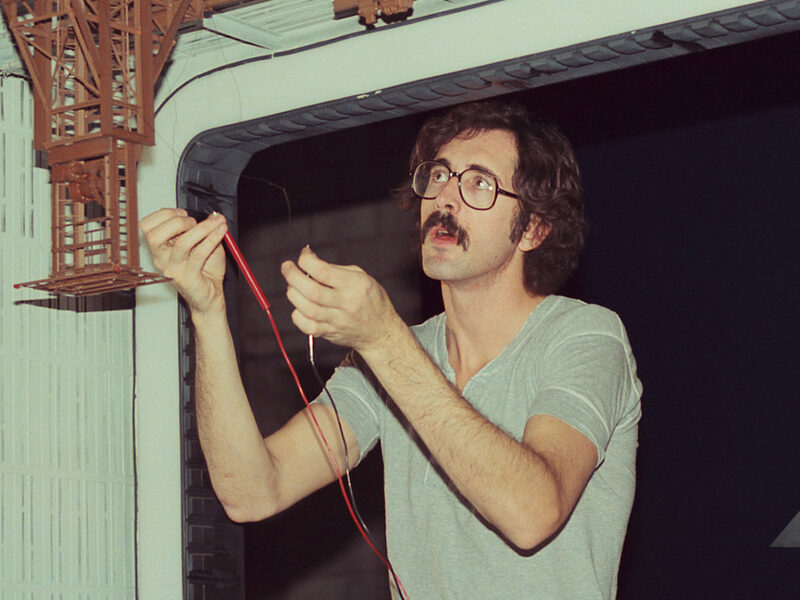 It seems like you and George Lucas and a few other creatives involved all came from a background of having similar interests, but then were able to use that to create something new. Roger Christian: Yes. That’s very true. StarWars.com: Can you talk about that a bit? Roger Christian: Well, I knew THX , and I think the only reason that I wasn’t fired every time I suggested using old guns and sticking bits on them for the weapons, and buying airplane scrap and creating the sets out of it — because I could buy it so cheaply and we couldn’t afford to make anything through the usual studio process — [was that] George was an independent director. 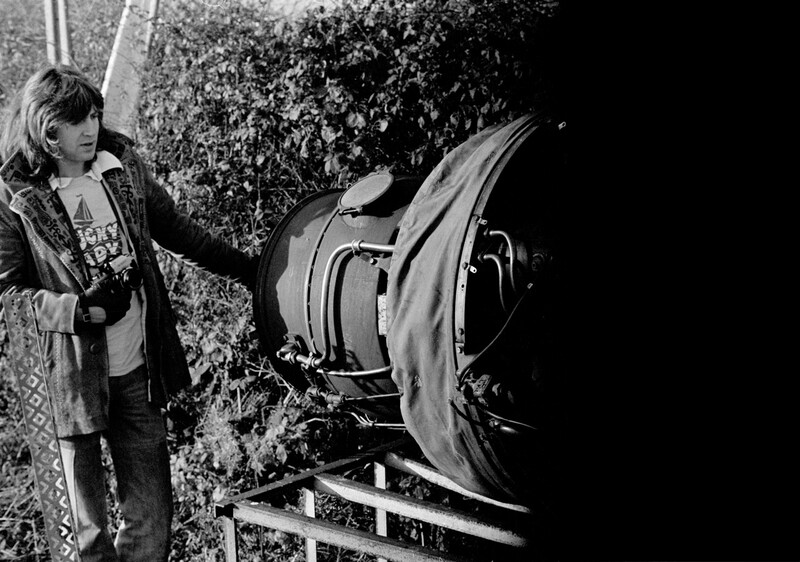 He had made his short films, he was very hands-on, and he made THX and he understood what he had to do to make incredible images of the future with, really, a small, tiny budget. And he knew it could be done. He created those police robots and things [in THX 1138], and I think we had a common kind of visual, in that we would watch Silent Running. One of my personal favorites was Alphaville, which Jean-Luc Godard made on the streets of Paris and created a science fiction. For me it was the first graphic novel ever filmed. Those films we looked at. I understood when George said, “I want it like Sergio Leone, like his dusty Westerns.” When he showed the crew Once Upon a Time in the West once we started, nobody really understood what he was talking about. They couldn’t make that leap between, “That’s a cowboy Western, what does that have to do with it?” He showed them [Federico] Fellini’s Satyricon, which dumbfounded everybody, but I understood. They were sets of massive scale and aged, but he never went, “Wow, look at this set we built!” He just filmed it like a documentary and that was exactly my sensibility. We looked at Solaris, the original, which most people found very angst and longwinded, but in between the space station was dripping water and it was broken down. And that was our common goal — to create a fusion of all of those ideas. The fact of having so little money to make what I had to make as an environment — with the sets, the vehicles, the robots, all of the weapons, the lightsaber — I already intrinsically knew I could give George what he wanted. He said, one day when talking to [production designer] John Barry and I, that he didn’t want anything to stand out. No prop to look as if it was designed. Nothing. The sets, nothing. And I think that was our big achievement, and I think that created a fundamental technique that’s still used to this day on science fiction. John Barry was brilliant as a designer and John’s sensibility was Barbarella. He liked all that fantasy stuff, but he was so intelligent and so kind of connected to his director that he immediately understood what George wanted. Taking [George] to Tunisia — and I knew Morocco and Tunisia, I’d done commercials and films down there, I knew these worlds — there was George’s vision right in front of him and he knew the film would work. So yeah, there’s a kind of destiny. It’s like the hero’s journey. You get struck and I was struck in that moment in Mexico when we met George. Takeoff: Roger Christian examining airplane scrap that would be used for sets. StarWars.com: A lot of film executives were kind of skeptical about Star Wars and this script that George Lucas had written. You were one of the few people who got to read it. It seems like you were always a believer in it from the beginning. So what did you see in it that made you think, “I love this, this is going to work, I want to be a part of this.”? Roger Christian: Well, I came out of Britain, and I was born at the end of the war. So I came out of a very gray environment. My father hardly spoke to any of us. It was not what you did. Children were silent. I got through my youth with King Arthur and Lancelot and all of these great stories and traditions and myths. I had a natural affinity to those stories, and so I understood. When I read the script, I just immediately understood. There was a lightsaber — although, I think in those days it was called a laser sword — and I understood, there’s the Excalibur that is the power. Here is the mentor, who is Merlin, who is now Obi-Wan Kenobi. 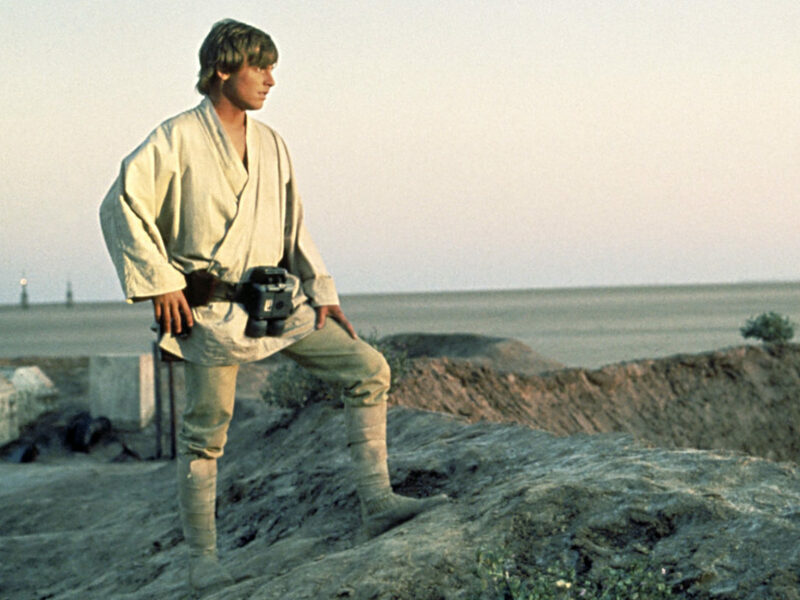 Luke Skywalker comes to a point in his life where he has to go on the hero’s journey and take the destiny that’s there for him, or you choose to stay a farm boy. And this deeply influenced me, and I always carried it with me in my own life. I recognized all of this and I recognized that George’s ability is unique. He’s created a film that you can skate on the surface and have a great Saturday morning romp. It’s the perfect myth, in fact, for the cinema age. Like all those great myths, you go beneath the surface, it’s all there in the moments that we key into on the hero’s journey. 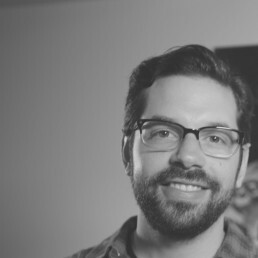 Joseph Campbell is right — Lucas is the only true living myth maker today. I was just talking about this in London, but my belief is that, George has created a saga that people believe in. And it’s because light transcends darkness and, unconsciously, everyone is attracted to that, which is the hero’s journey. They may not consciously understand it, but unconsciously. I saw all that in the script when I first read it, and I just embraced it. Seeing those first six paintings of [concept artist] Ralph McQuarrie, there was the world. This wasn’t a mythology. This wasn’t George saying he wanted something, and then, “No, no, you gotta make it. It can’t be like that.” This was real, and for me it was a dream come true. [Laughs] I’d always wanted to make [something like this], and here it was. I liked science fiction and I read books like Dune and 2001 and William Gibson. All the great authors who really developed real worlds, I loved. And here it was. 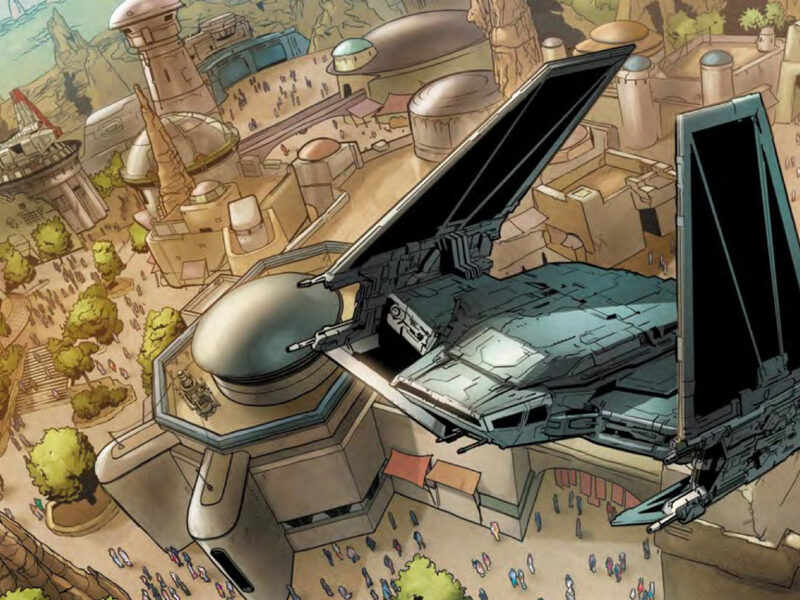 StarWars.com: You even talk about it in the book, that you were a comic and graphic novel fan, which today is widely accepted. I can’t imagine that having been as accepted back then as it is now. Roger Christian: No, it wasn’t, and in fact, they were all very sanitized. I used to get my comics, which had Dan Dare and Eagle in it, every week delivered to my house on Tuesday. We would go to Forbidden Planet’s first little tiny shop, and I could get Judge Dredd — that was really the first [innovative] one that came in — and 2000 AD. The [publisher] kind of looked at a world that was very sanitized — television in those days, it was very proper, you couldn’t really do anything. He decided to make graphic novels that were very against it, and that’s how it all happened. All these artists went through that company and it was embraced. I would collect. [Enki] Bilal is a French graphic novel maker from the era, and I collected everything he ever did. He did grungy worlds set in London, breaking down, and Romania, countries like that. These were a huge influence on me. Also, George has always said to me, “I make films for nine year olds. It’s not my fault adults like them.” [Laughs] And that’s also true. In my youth, the one thing I got my mother and forced her to do, was take me to Saturday morning cinema, which was always full of children. But I would watch these types of movies and just go into a world and think, “Wow, this is amazing. This is how life should be.” And here we were making one. StarWars.com: Can I just name some sets or weapons and have you talk about them? 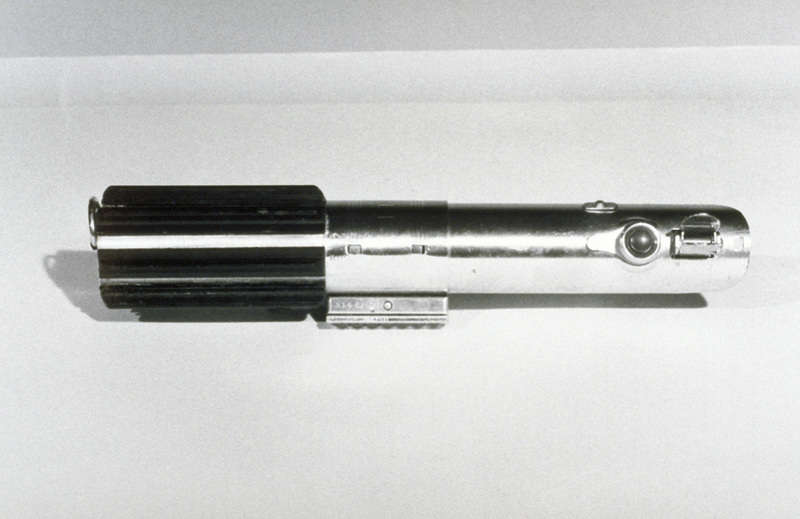 StarWars.com: To start, Han’s blaster. Roger Christian: The first thing I ever did, and I didn’t tell George, I went to the gun hire place and made a Sterling submachine gun for the stormtroopers, because I wanted directly what Ralph McQuarrie had done and made it work. And then I thought, the other weapon that I should make and show George to see if I will get fired or if I’m on the right track, was Han’s weapon. George always said to me, “He’s a Western. He’s like the cowboy element in there.” So I looked around, and then as soon as I saw the Mauser, which was an automatic pistol, it had a wooden stock — it was exactly what I imagined would be the kind of future version of a cowboy’s gun. So just sticking some sight on the top of it, like a long-range rifle sight, and sticking a piece of a [muzzle] guard to stop the flash being seen at night… Sticking those bits on it, I knew it was iconic. And if you look at that first photograph of Harrison [Ford] in the costume at EMI studios, he’s holding it and behaving like a cowboy would. He was spinning it and putting it [in his holster]. I knew then, as I was there, that I had picked the right tone with this. 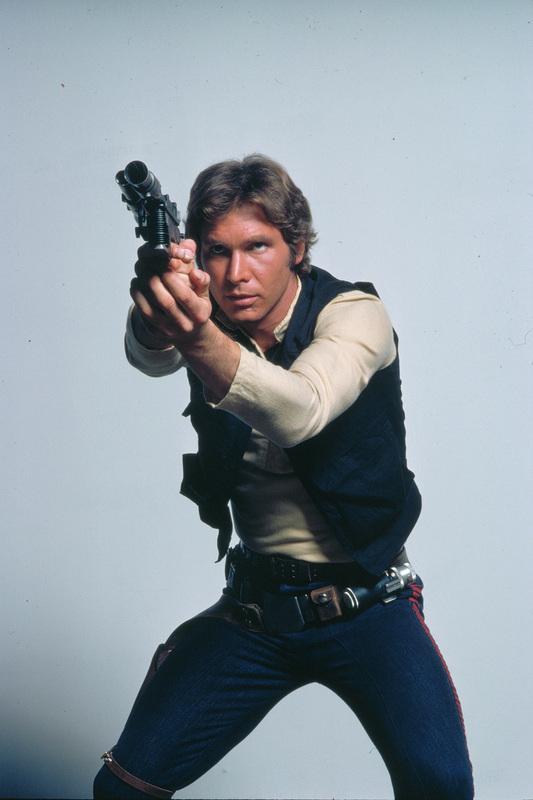 StarWars.com: One thing I noticed in the movies is that when Harrison Ford draws the blaster quickly, it almost wobbles in his hand a little bit, and you realize that that’s because it’s actually heavy. Roger Christian: Yes. That was the other thing I always rejected in films. You can see that they’re very light, they’re made of plastic, and they go “beep beep.” I discussed this with George. I thought the weight helps an actor to convince us that it’s real, because they’re not pretending. And when you’re pretending, you’ve got a weapon that’s light, you don’t believe it. I don’t anyway, and I don’t think audiences do. 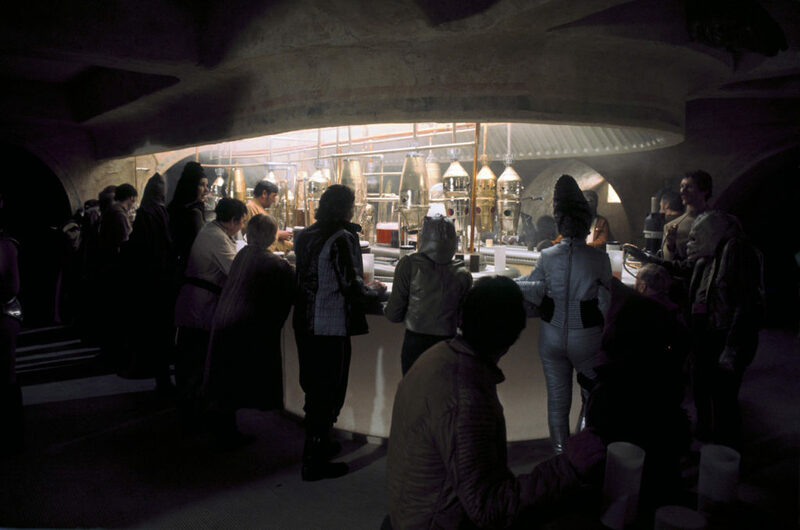 StarWars.com: Aunt Beru’s kitchen and the dining room. Roger Christian: John very cleverly said, to make this familiar, he designed it exactly in the shape of an airliner. He said that’s how it would be because of air pressure and everything. Then when we looked at it, I thought, they live in a station that’s miles from anywhere, like a farm that’s remote. Anything that would come up here would be packed into crates and brought up and it would all be standardized units. Tupperware was just coming into prominence then, and I really liked the look of a lot of it, so we ordered Tupperware galore. She was supposed to be boiling greens, so I found Chinese bok choy, which was very rare at the time. I thought, “This looks interesting.” I made, out of bits of airplane scrap, her little cooking saucepan that she was boiling that in. 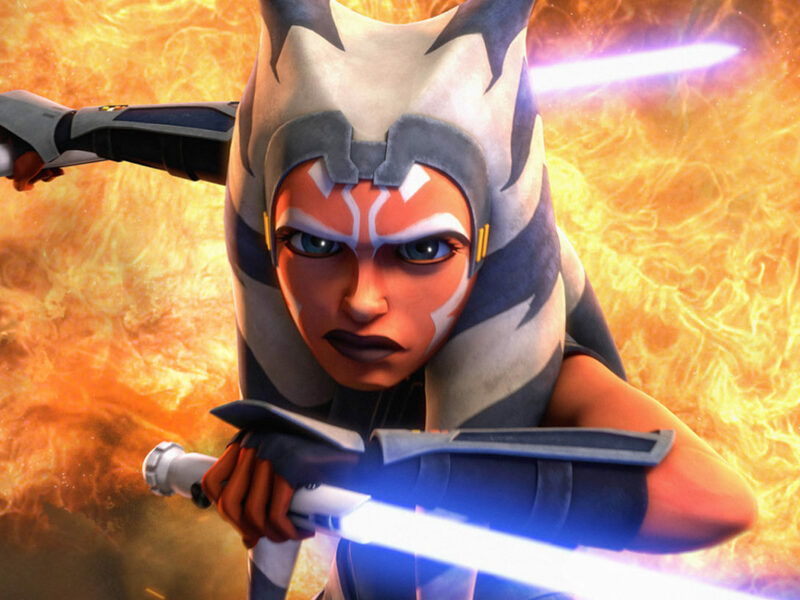 StarWars.com: Where she’s just dropping it in? Roger Christian: [Laughs] Yes. I used airplane containers and things, because I bought lots of those, and they looked really real and they worked. I had a lot of time agonizing over blue milk because there wasn’t much that I could find. I knew we were gonna be in Tunisia, milk would be difficult to get, and also it would be hot. So I had to have something they could drink, because I knew they were going to be drinking it. I eventually found what’s called cochineal. It was a food coloring that was more like the [food coloring] for blueberry. So I found that and, eventually, mixing that, I got it. Because everything I did, it would curdle and look terrible. I eventually found a way of mixing it that I could give it to the props [department], because I knew I would dress the set and leave for the next one. The props had to handle that. So that worked. StarWars.com: Did you ever think, out of all the things you made, that blue milk would go on to become one of the most iconic? Roger Christian: [Laughs] No. [Laughs] I just kept thinking, “What is this blue milk?” And then there it is on the table in Rogue One. [Laughs] It’s blue milk. There’s many references back. No, I just kept thinking, “How can I do this?” Right to the last minute, I was thinking, “How can I make this work, for goodness sake?” Because it’s written in the script and I didn’t want to fail George, because he had written it. Roger Christian: John Barry put the designer [Harry] Lange, who was a draftsman on 2001, on it on purpose to try and create something that was 2001-ish, but would look real. And of course, I had to come and completely mess it up. I found fighter-pilot ejector seats, which I bought, and those went in and I thought, “Ah, now that’s starting to look like something.” Then I had to make up all the little levers that Harrison and Chewie would pull, and make those functional so they didn’t fall off. You could only see the top of them. Then I just dressed the hell out of it using my broken-down airplane bits that looked right, panels that I could find. We had an advantage, because they couldn’t afford to shoot both ways. They really only shot one way on there. That was the first set that was fully dressed. I had to take George and show him, and I was crossing my fingers. I had told everyone, “I can make it work with airplane scrap,” but it’s another thing doing it. [Laughs] I got it and I thought “You know what, I think this looks quite cool. I think this will be alright.” And I took George down and he signed off on it immediately. The only thing was, I said, “George, I think things should be a little bit personal in there, and you had a pair of dice hanging in Ron Howard’s car in American Graffiti.” It’s like good luck, and everyone had dice then. For some reason they were just the thing to have in your car. So I suggested that. He said that would be a great idea, and it would suit Harrison. And then I showed him six pairs of dice and he chose those chrome ones. I think that just cemented that there’s something personal about it. They’re only in about two shots, then the DP took them out for some reason and they never got back in again. J.J. [Abrams] put them back in and they’re on the Vanity Fair cover that Annie Leibovitz did, originally. There they are. But the scenes that he put them in got cut out of the movie. [Laughs] The dice are legendary. They are there in A New Hope, in a couple of scenes. 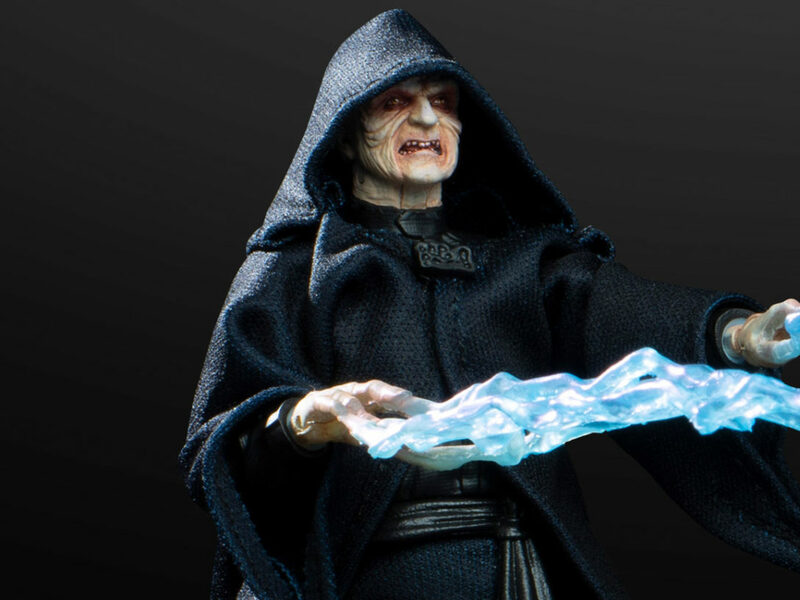 StarWars.com: How about the lightsaber. Roger Christian: I knew it was such an amazing invention by George and I knew this, if anything, would be the iconic image of this film. Just as Excalibur is as important to Merlin and to King Arthur. It confounded me to find something, because by then I had to find found objects to base things on, and I realized the advantage of that is there are things that you don’t or wouldn’t necessarily design. The special effects team under John Stears made quite a few torches that looked terrible. They looked like just metal round things, that George kept rejecting and rejecting. I was under huge pressure because everything had to go in advance on trucks to Tunisia, because that’s where we started shooting. They were pressuring me to get this and it was pure accident. I made Luke’s binoculars. I had found three different cameras, which I stripped and took the parts of. I knew I had to stick two lenses on to make it look like binoculars, so I went to the camera shop that we always bought all our equipment from, in central London. I bought the lenses and then, the owner was just there. I said, “Do you have anything I could look at that might be odd or strange or different, that might be to do with cameras or flashes?” And he said, “Well, look, there’s a whole load of boxes under that shelf there. I haven’t looked in them for years, I don’t know what’s in there.” It was literally the first box I pulled out and pushed the dust off the top of it and opened it. 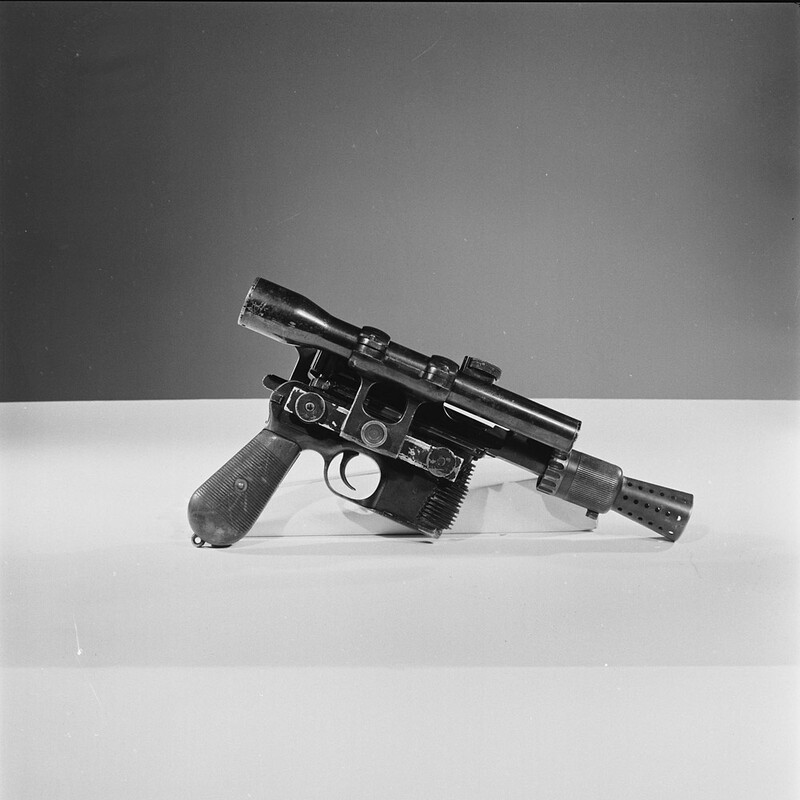 And in the tissue paper there was this Graflex., I just took it out and knew that I had found the holy grail. It looked so beautiful. It had the red firing button, it had another button, and it was weighty and exactly the right size. So I got in my car and ran back to the studios. I thought, I’ve got to have a handle. So I stuck the t-strip that I’d used for the handle of the stormtroopers’ weapon. I stuck that around the handle. I had broken-down calculators, and I loved the little bubble strip which illuminated the numbers underneath, and magnified them so you could read it on the screen. That fit perfectly into the clip. And I called George over and he just held it and smiled. That’s the biggest approval from George that you can get. He doesn’t have to say, “That’s great,” or “Do this.” The only thing we agreed was [Luke] wouldn’t use it in Tunisia, but he would have to hang it on his belt. So I stuck a d-ring on the end of it, and that was it. Then I made five or six of them. The two that I made went out to Tunisia, and then that’s the one that Obi-Wan brings out of his box and gives to Luke. StarWars.com: It’s somewhat ironic that your discovery of the lightsaber is almost exactly the same as Rey’s discovery of it in Force Awakens. Roger Christian: It’s exactly the same! [Laughs] It’s just taken on this story about it. It’s got its own magic, there’s no question. It’s a beautiful object. I’ve still got mine. StarWars.com: The cantina bar, particularly all the stuff hanging in the middle. Roger Christian: Yes, that’s nearly all airplane scrap. [Laughs] Chromed. I found a way to chrome plate it. The draftsmen — I had a massive area that was full of broken-down pieces of jet engines, anything we could find that I thought was interesting — they would come down and take pieces and draw them into the set. After a while they got used to it, because they didn’t know how to do this. They would [normally] draw everything up and you’d go and make it. There wasn’t time to do that, so they understood and they came down and took pieces. Most of that is airplane scrap and PVC piping, drain piping, which I bought in all different sizes. From quarter-inch all the way up to about two or three feet. Huge. Sewer drain pipes and things like that. All of that came from scrap, and they just found a way to place it and put it up. I love that set. StarWars.com: It’s another set that when you see it, you instantly know what it’s from. Roger Christian: Yeah, and I knew it would have to be kind of smoky. I found an old junked piece of a case for something, I don’t know what, but I turned that into what would be a future cigarette machine, [Laughs] and stuck that at the entrance when you come in. 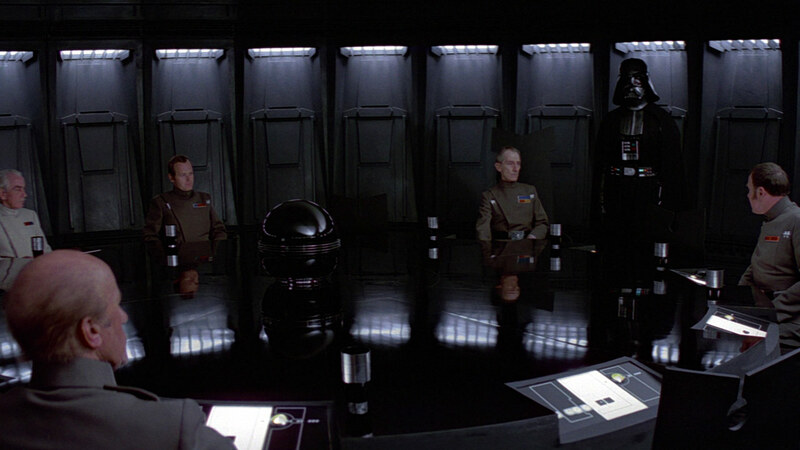 StarWars.com: The Death Star conference room. Roger Christian: Right. 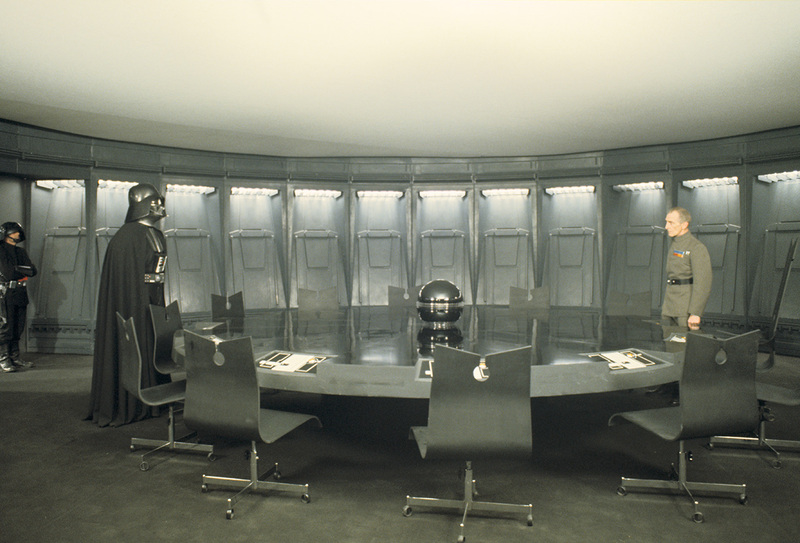 That, to me, was the first real interior of the Death Star, and there were a lot of battles over the color between John Barry and the director of photography. John wanted it black because it’s evil. This is the home of evil, but the color got slowly dissipated down, and I think John painted it eight different times at the behest of the director of photography. It ended up where he just got George and said, “That’s it. We can’t go any lighter than this, it’s not going to work,” and he was right. It did work. This one, I thought long and hard on, because there was a conference table and everything was black. I couldn’t find chairs that would really suit. So John Barry did make those. He designed the chairs. I brought several ones in but they just didn’t do it, so John quickly made those up. I thought, “There should be a communication device on the table,” and again, I couldn’t find anything that I thought was right and I didn’t want to make something. Then I found a floor heater and as soon as I saw it, I grabbed it, cut the wires off, and got the paint shop to spray it black, and that went on the table in the middle. I thought, “That’s it.” It’s almost like [Albert] Speer, the architect for the Nazis, managed to create very simple, very graphic, but very powerful images and buildings and interiors. So we wanted to kind of echo that, and I did put on some, what was the equivalent of notepads. They weren’t electronic devices, but they were similar, little early things that you could write on. I just put a few of those around and, really, we left it at that. 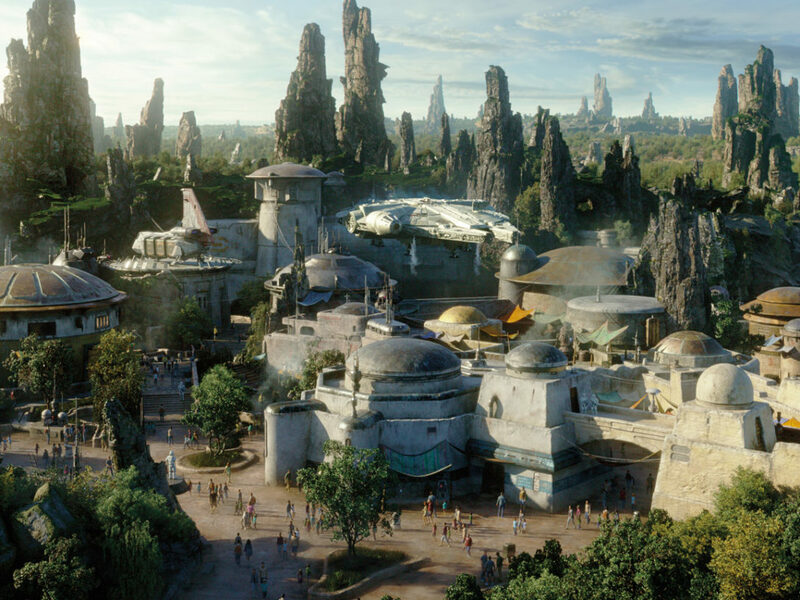 StarWars.com: That seems like a real challenge, to have to shift from decorating something like the Falcon, which looks like it’s been repaired a million times and is dingy and dusty, and then have to go and create the most clean, perfectly designed room in the galaxy. Roger Christian: It was a challenge, and we looked at 2001, and that did look futuristic. That was an influence for George and he showed the crew 2001, but again, it couldn’t look like that. I knew that we had to create something that really echoed the evil that was at the heart of this Empire, fueling off the colors of Ralph McQuarrie and the way he painted things, and the way he painted Darth Vader. StarWars.com: Do you have a favorite item or set that you built or created for A New Hope? Roger Christian: The lightsaber is my favorite, there’s no question. I mean, I just loved it. Also, Ralph McQuarrie’s painting of Chewbacca, he had a gun. I showed George, early on, when he came to the gun hire place with me — and by the way, George and I made Princess Leia’s gun together. He got his fingers stuck together in super glue like me. We stuck that together. But that’s George, he loves doing that stuff. But, I’d seen this bowcaster with the balls on the end and I just thought, “There’s something about this.” I showed it to George and I said, “You know, I would stick some gun sights on this to make it look a bit more like Star Wars world,” and he said, “You don’t have to say any more,” and they changed the script. Again, Chewie in The Force Awakens, you see pictures of the two of them and Han is going, “Let me try this. Wow, this is really cool!” [Laughs] I liked that instant use of what’s there and adapting it. George was very open to that. That one is a favorite. Sets like the cantina is an obvious kind of world that I think everyone identifies with for the future, and I did like that, and I liked the Millennium Falcon cockpit. In terms of influence, we could only afford to build half of the Millennium Falcon on the stage, we couldn’t do the whole. But just people coming on that set for the first time, and the look on their face, I think it says it all. That looked amazing, that set. I got tubes and pipes from airplane refueling, and we even had a [refueling] vehicle. Putting it all together, and the pieces around it and sticking the scrap on it — it looked amazing, I must say, in real life, that one. StarWars.com: Did you have a feeling that you were really creating something special while you were working on the movie? Roger Christian: I did, yeah. I never had a day off for almost a year. Saturdays, Sundays, bank holidays, I just worked. And going home at night, there were three restaurants on the way home that did take away, and I would just try to even it out, which one I would have on Monday, Tuesday, and Wednesday. We were just too tired to cook anything. I think John Barry kind of knew it as well, and I certainly did. I just didn’t know that it would connect in the way that it has, that’s for sure. Seeing the film for the first time in, I think it was December — there was a crew screening in London — and just the buzz in that cinema was incredible. I knew then, we got it right, and it was like watching a new film, from slaving everyday to try to get the best for George and support George. Because I believed in it and in this world he was creating. And he’s created the perfect myth. It’s for the cinema age. George fully understood the hero’s journey and fully told it as a drama. And it is a return to Saturday morning cinema, it is a return to cinema for families, for everybody. I kind of saw that it could do that, but never imagining now, that this would be probably the biggest myth that’s ever connected so widely to a population of the Earth. 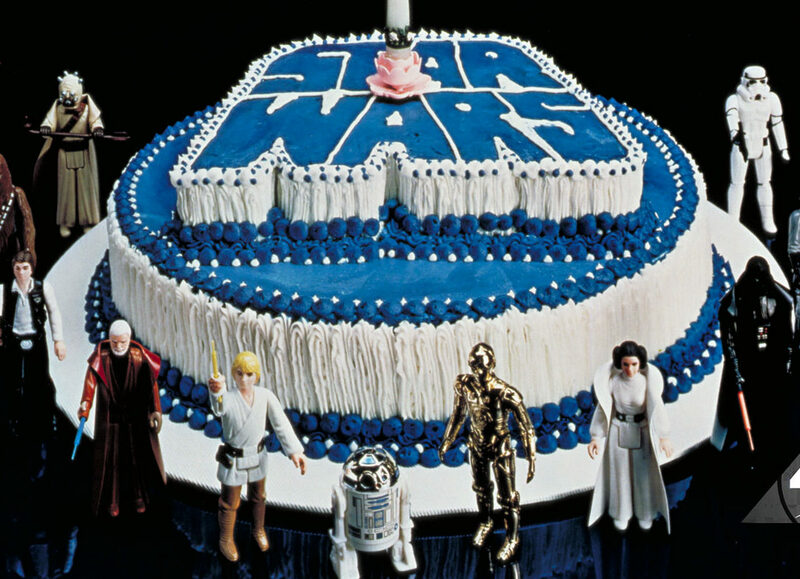 StarWars.com: So, 40 years later, when you look back, what does it all mean to you? Roger Christian: Well, it changed my life. 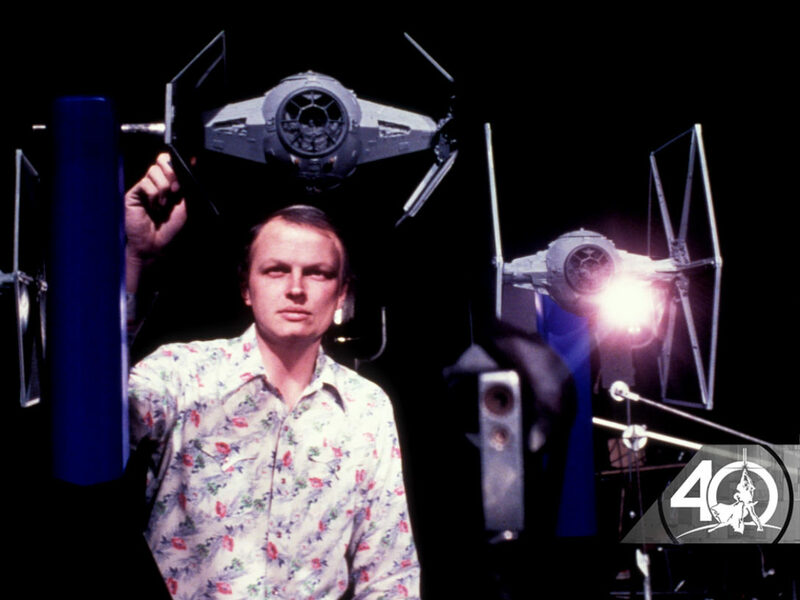 George and I did connect, and he really got me going as a director by commissioning Black Angel to go out with Empire Strikes Back, then working as second unit director to George on [Return of the] Jedi and Phantom Menace. It certainly changed my life and I personally believe, as less and less children are read to and they’re more looking at cartoons and animation and things like that, it’s really important to connect to this hero’s journey. There’s keys in there for us growing up. I’m really proud to have been part of that, in terms of what’s become the most powerful cinema-saga ever in the history of cinema. And I think it always will be. When I first met [producer] Rick McCallum, they asked me to come to the ranch, and he took me into George’s office. 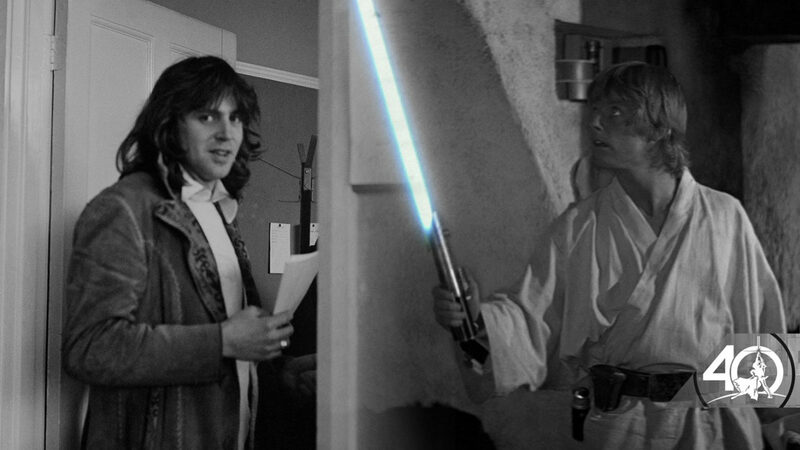 George just stood there and said, “You know Rick, only six people really stood by my side for Star Wars, and Roger was one of them.” It’s not egotistic at all, it was just a reality that I witnessed, daily, the hardships that George went through. It put him in hospital to get this film made. So I’m just very proud to have stood by George, and have all these years.